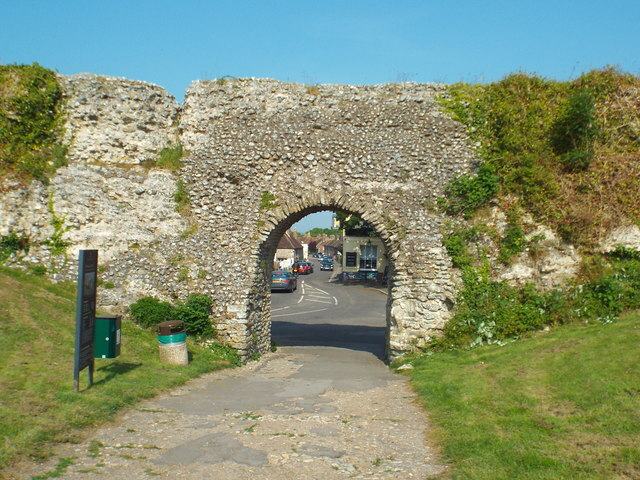 An arch in the wall surrounding Pevensey Castle. This view was taken from within the grounds of the castle, looking out into the village of Pevensey. Pevensey Castle is a medieval castle and former Roman Saxon Shore fort at Pevensey. The site is a Scheduled Monument in the care of English Heritage and is open to visitors. Built around 290 AD and known to the Romans as Anderitum, the fort appears to have been the base for a fleet called the Classis Anderidaensis. The reasons for its construction are unclear; long thought to have been part of a Roman defensive system to guard the British and Gallic coasts against Saxon pirates, it has more recently been suggested that Anderitum and the other Saxon Shore forts were built by a usurper in an ultimately unsuccessful attempt to prevent Rome from reimposing its control over Britain. Anderitum fell into ruin following the end of the Roman occupation but was reoccupied in 1066 by the Normans, for whom it became a key strategic bulwark. A stone keep and fortification was built within the Roman walls and faced several sieges. Although its garrison was twice starved into surrender, it was never successfully stormed. Pevensey is a village in the Wealden district of East Sussex, England. The village is located 5 miles north-east of Eastbourne, one mile inland from Pevensey Bay. It was here that William the Conqueror first landed on and invaded England in 1066 after crossing the English Channel from Normandy, France. The village has a range of services. In and around the village is a Roman Fort, Castle and Grade I listed Parish Church. 1066 Country Walk is a 31 mile (50 kilometre) walk from Pevensey to Rye. You can follow in the steps of William the Conqueror taking in historical sites on a generally low level walk. The route includes the Normans' landing point at Pevensey, the battle site, and the castles at Pevensey and Herstmonceux. There are links from the main route between Battle and Bexhill and between Doleham and Hastings. It is waymarked using red circles with a sword. Is a memorial window to Lieutenant Alexander Boswell Campbell of the 8th Battalion, Royal Sussex Regiment who died of wounds received in action near Ypres on 13th September 1917. St George on the left represents his love of England with the Campbell crest with the motto 'Constanter et Prudenter' below. St Hubert, depicted on the right, represents his enjoyment of hunting (Hubert being the patron saint of hunters (amongst other things)). Below him is the badge of the Royal Sussex Regiment. Alexander Campbell was Master of the Hailsham Harriers and also hunted with the East Sussex, Eastbourne and Southdown Hunts, and in many cross-country races, winning the Heavy-weight Cup at the Eastbourne Hunt Point-to-Point Races in 1900. He was a keen fisherman and shot and had hunted big game in Yukon and Newfoundland.